This 10-week traineeship from January to March 2019 will see Charlotte assisting on three productions – Kes (Robert Alan Evans), random (debbie tucker green), and Hamlet (William Shakespeare) – in their temporary theatre space, the Pop-Up Theatre. 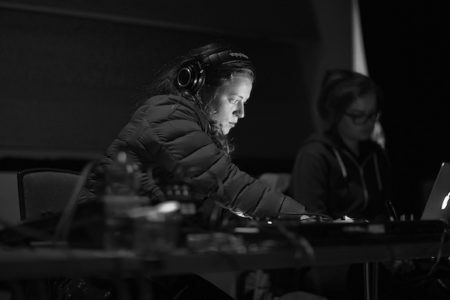 Charlotte will also be responsible for creating the sound design for Dinner 18:55, a devised intergenerational theatre production created by the Leeds Playhouse’s Creative Engagement department and performed by members of their Young People and Older People’s programmes. Over the course of the traineeship Charlotte will also receive bespoke mentoring from established Sound Designers both within and outside of the Leeds Playhouse including Manchester’s own Alexandra Faye Braithwaite. “I feel incredibly lucky to have been chosen for this amazing opportunity. Since dipping my toe into the world of sound design on some smaller projects over the last year, I realised it was something I would love to do for a career. I assumed I’d got into it too late, and would never have enough experience or the technical skills to succeed professionally. At Brighter Sound, we’re committed to addressing inequalities in all areas of the industry, including backstage, tech and production roles where the gender gap is particularly prominent. According to Sound Girls only 5% of all sound engineers are women, whilst the Music Producers Guild estimate that only 6% of their membership are female. This doesn’t look set to change any time soon, with less than 10% of applications to Music Tech degrees coming from women according to UCAS. This is the first in a number of traineeships that we are supporting to address gender inequality across backstage roles. Find out more about Both Sides Now here. Charlotte Bickley aka CARLOS is a DJ and sound artist based in Leeds. She is primarily interested in ambient and experimental sounds and composition, which she explores in her productions and live sets, as well as her monthly radio show on KMAH Radio. Her work focuses on texture; creating dense, complex soundworlds through the blending and layering of multiple sound sources, which she has recently begun to translate into sound design, collaborating with visual artists on interactive sets and installations. In 2018 she released her debut tape on Manchester label Cong Burn, with an LP to follow in 2019. We use an inclusive definition of ‘women’ and ‘female’, welcoming participants who may identify as non-binary, cis-gendered, or trans.